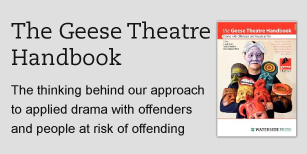 Geese Theatre Company is an internationally renowned team of applied theatre practitioners and group workers, working primarily within the UK Criminal Justice System. The company has a reputation for innovative and dynamic work with adult and young offenders, which has been validated by independent, academic research to have an impact on attitudinal and behavioural change. We pride ourselves on delivering exceptionally high quality performances and projects. Every piece of work is thoroughly researched, evaluated and reviewed in order that we can continually develop our own practice. 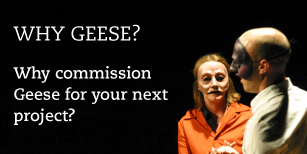 All Geese projects and performances are delivered by our own in-house team of practitioners and performers. All members of our team are permanent employees who have undergone a rigorous six-month training programme and who are encouraged to continually reflect on and improve their practice. The team is managed by our Artistic and Deputy Artistic Director, who between them have 38 years’ experience of developing arts-based projects in Criminal Justice settings. The company is widely acknowledged as being one of the key organisations championing the role of the arts in the Criminal Justice System and has been the subject of two nationally broadcast documentaries, received a BAFTA Interactive Award, a Barclays New Stages Award, an Investor in People Award, a Butler Trust Certificate for a theatre-based offending behaviour programme, and in 2013 received the Royal Society for Public Health’s “Arts and Health Award” for innovative work with offenders with mental health issues. Since 1987 the company has worked with over 250,000 offenders or young people at risk of offending and with 60,000 other individuals. The company has worked in excess of 150 prisons across the UK and delivered projects internationally in seven other countries, including Bulgaria, Brazil, Azerbaijan and Sweden. Create approximately 40 performances for conferences, watched by 4300 people. Most current research suggests that experiential methods are at the heart of effective practice with offenders and that programmes should use a range of active learning styles and incorporate opportunities for individuals to safely practise new skills. Social Learning Theory (Bandura, 1977) explains the principles by which learning occurs in a social context. It describes how new skills are best taught through an interactive process and offers an important conceptual framework for helping participants to develop new skills in a conscious and structured way through rehearsal and skills practice role-play opporunities. Role Theory suggests that much of human interaction can be understood by considering the roles and scripts we perform as we go about our daily lives. This concept allows individuals to consider which roles would be useful for them to develop as they move forward. For example, an offender who has spent several years in prison and who has never worked might want to rehearse and practice the role of employee. building positive social ties – through drama-based activity participants are invited to reflect upon the impact their offending has on their social networks and are encouraged to develop life skills which will enhance social ties. disrupting negative identities – through the taking on of new roles (in scene work and performance) and the relationships built with Geese practitioners, participants are able to constructively challenge the potentially negative identities they have internalised and develop hope, belief and motivation for the possibilities of new identities. Stunning. I was totally engaged and it was emotionally very powerful. This had the most impact of any and many conference I have attended.